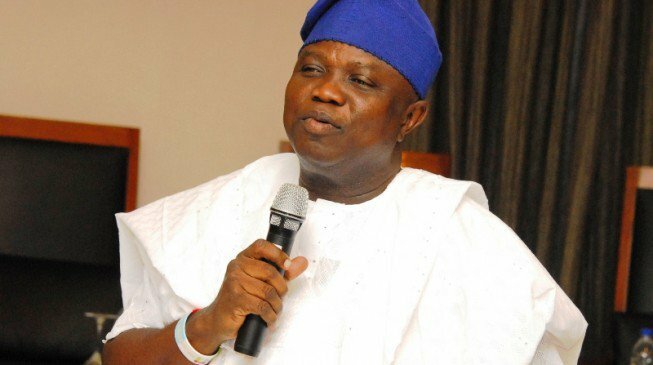 The Lagos State Government on Tuesday said the first DNA Forensic Centre to be established in Nigeria by any State Government will become operational by the first quarter of 2017, expressing optimism that the centre will go a long way in bringing about seamless administration of justice. 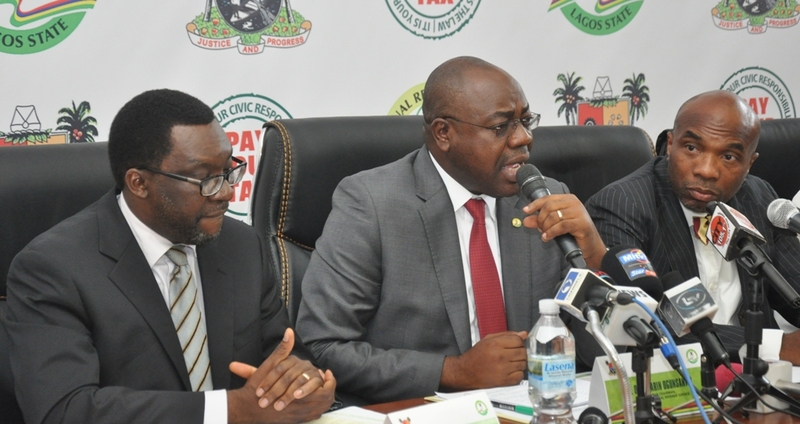 Speaking at the maiden edition of annual Lagos Forensic Symposium held at De Renaissance Hotel in Ikeja, the State’s Attorney General and Commissioner for Justice, Mr. Adeniji Kazeem, said meticulous processes were being put in place in partnership with international renowned experts in forensic science to ensure that the centre, upon completion, is compared to the best in the world. 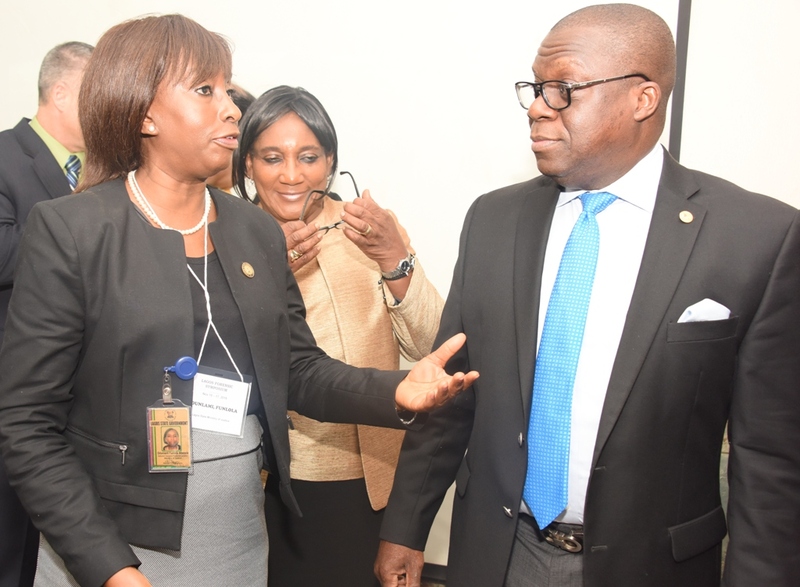 Attorney General & Commissioner for Justice, Mr. Adeniji Kazeem (right); Solicitor General/Permanent Secretary, Lagos State Ministry of Justice, Mrs. Funlola Adesola Odunlami (left) and Justice Modupe Nicol Clay (middle) during a 3-Day Lagos Forensic Symposium organised by the State Ministry of Justice and ITSI – Biosciences, USA, at De Renaissance Hotel, Ikeja, Lagos, on Tuesday, November 15, 2016. Kazeem said the symposium, which was put together by the Lagos State Ministry of Justice and ITSI-Biosciences, Johnstown, PA, United States, was part of measures to sensitize key stakeholders in the justice administration system with the view to adequately prepare them for the new technology coming on board. 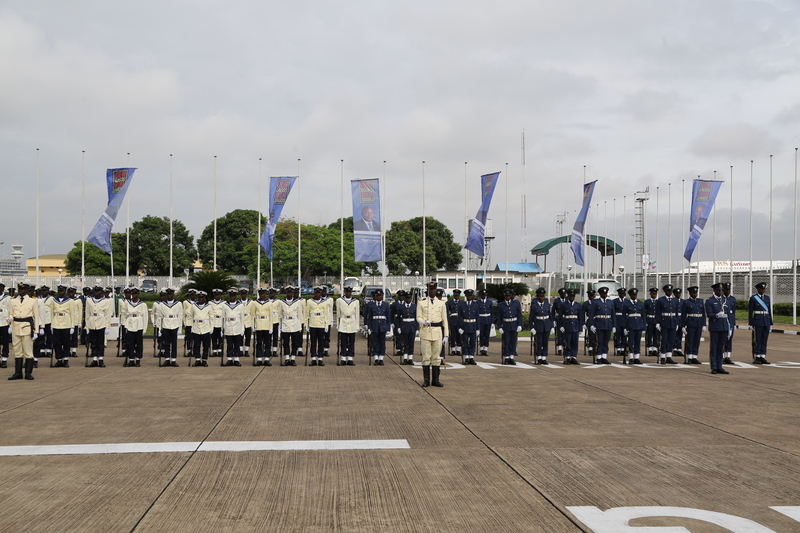 He recalled that since inception, the present administration under the leadership of Governor Akinwunmi Ambode had made law and order and security as one of the major focal points of his administration, especially with the procurement of multi billion naira equipment for the police and other security agencies. “In the same vein, in order to ensure that there is proper investigation and prosecution of crimes, the Governor approved that this DNA Forensic centre be established. The centre will be world class and the first by any State Government in Nigeria and it will help in investigation, prosecution and adjudication. 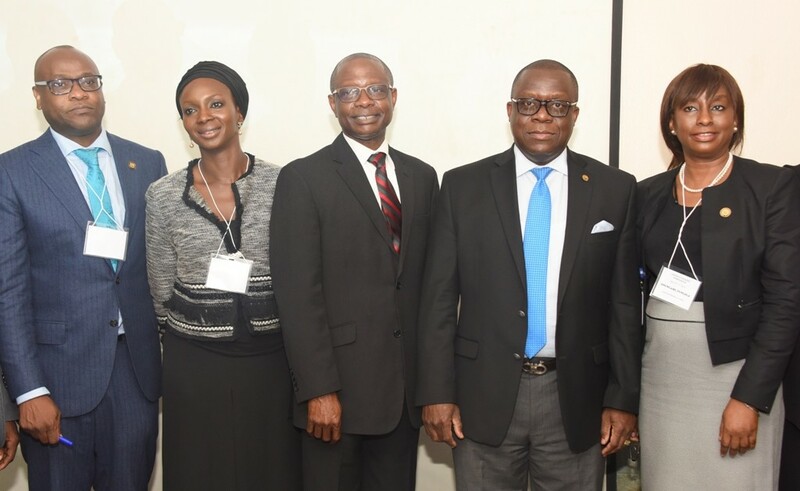 Assistant Director, Directorate of Public Prosecution, Lagos State Ministry of Justice, Mr. Jide Martins; Special Assistant to the Attorney General & Commissioner for Justice (Lagos), Iyabo Oshodi; President & Chief Scientific Officer, ITSI – Biosciences, USA, Dr. Richard Somiari; Attorney General & Commissioner for Justice, Mr. Adeniji Kazeem and Solicitor General/Permanent Secretary, Lagos State Ministry of Justice, Mrs. Funlola Adesola Odunlami during a 3-Day Lagos Forensic Symposium organised by the State Ministry of Justice and ITSI – Biosciences, USA, at De Renaissance Hotel, Ikeja, Lagos, on Tuesday, November 15, 2016. “What it means is that our crimes will be resolved faster, there would be more potent and precise investigation by the police and the situation where people are wrongly accused and convicted will be eliminated and the right people who have committed crimes would be prosecuted. This is good for Nigeria, it is good for Lagos and it shows that Lagos is a leader and it will continue to be a leader in innovation and technology. “The centre is going to be ISO certified which means it is going to be world class; it is going to be used by not only Lagosians or Nigerians and I am sure that international institutions or organizations, embassies that are in Nigeria will utilize it. People from West Africa and even in the entire sub-Saharan Africa will utilize it. We are not going to cut any corners and it will be world class. 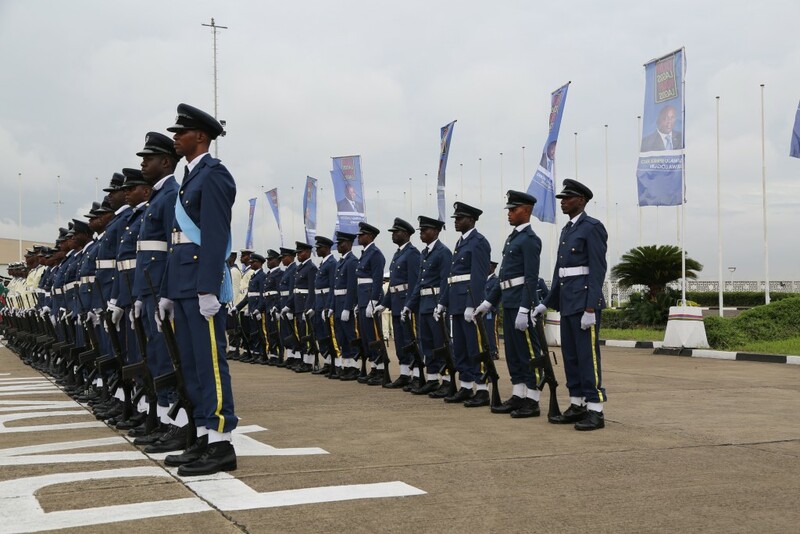 What people do presently is that some of the samples for testing are flown abroad for sampling in South Africa, United States, United Kingdom and the likes but we are going to stop all that and have our own world class DNA Forensic Centre here in Lagos,” Kazeem said. 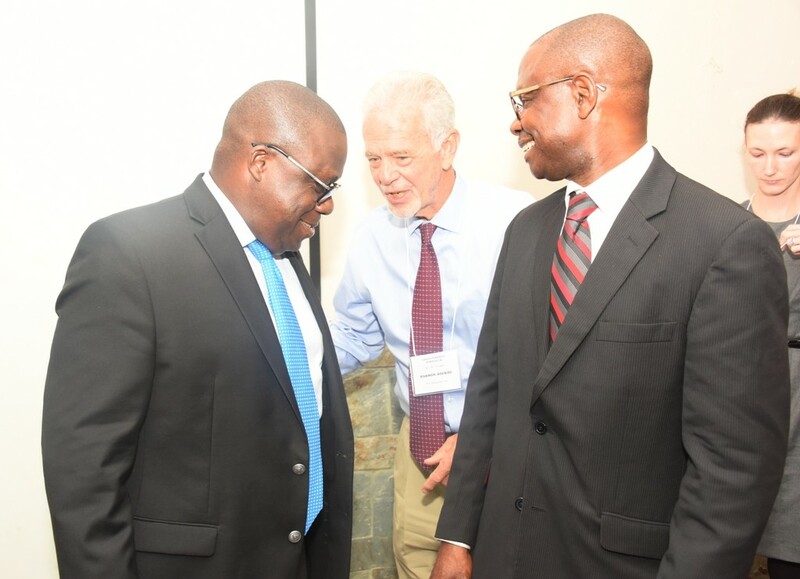 L-R: Attorney General & Commissioner for Justice, Mr. Adeniji Kazeem, with Attorney & Forensic Consultant, ITSI – Biosciences, USA, Mr. Rockne Harmon and President & Chief Scientific Officer, ITSI – Biosciences, USA, Dr. Richard Somiari during a 3-Day Lagos Forensic Symposium organised by the State Ministry of Justice and ITSI – Biosciences, USA, at De Renaissance Hotel, Ikeja, Lagos, on Tuesday, November 15, 2016. Lead discussant at the symposium and President of ITSI-Biosciences, Dr Richard Somiari said the State would benefit a lot from the DNA centre, adding that with forensic capabilities, crimes would be resolved faster, and some many cases which hitherto could not be resolved would be addressed faster. 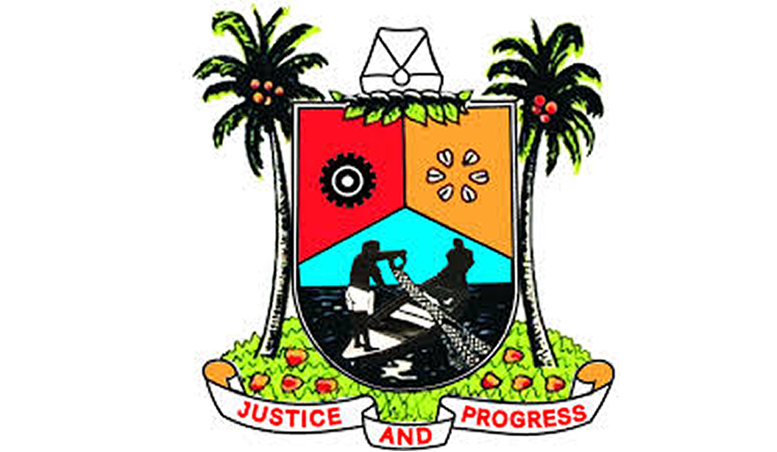 On his part, Chairman of Ikeja Branch of the Nigerian Bar Association (NBA), Mr. Dele Oloke, said the establishment of DNA centre was an eloquent confirmation that Lagos is being governed by deep thinkers and vibrant people, adding that the centre would also help in reducing incidences of innocent people being unduly punished, thereby reducing cases of awaiting inmates in the prison. 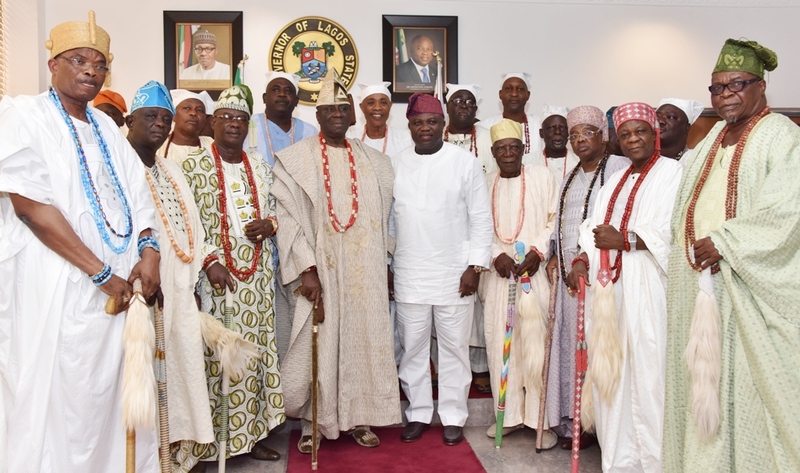 Lagos State Governor, Mr. Akinwunmi Ambode on Friday restated his administration’s commitment to reforms in the state civil service, saying that only a viable workforce can drive the policies and programmes of any government. The Governor who spoke when he received the Head of Service of the Federation, Mrs Winifred Oyo-Ita, on a courtesy visit at the Lagos House, Ikeja, said he remains a strong supporter of public service reforms, adding that any government desirable of making positive change in the lives of the citizenry must have a motivated and trained workforce. 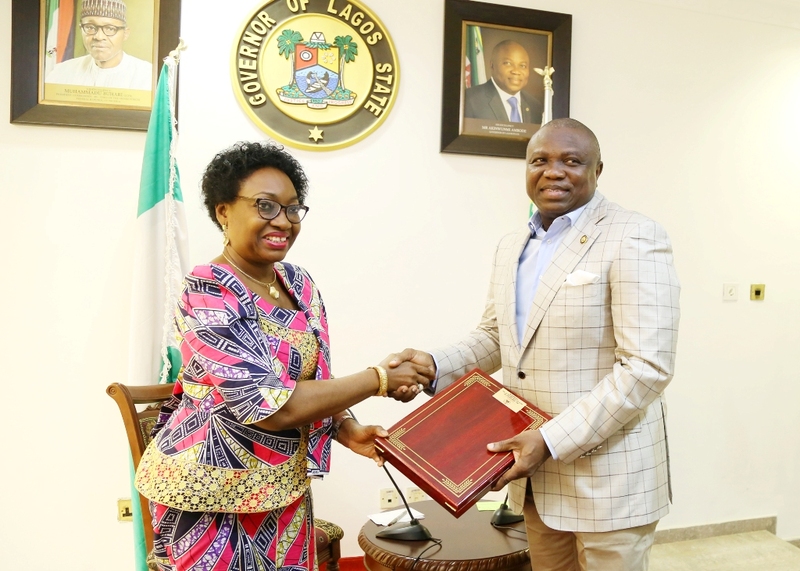 Lagos State Governor, Mr. Akinwunmi Ambode (right), being presented with a frame by Head of Service of the Federation, Mrs. Winifred Ekanem Oyo-Ita (left), during a courtesy visit to the Governor, at the Lagos House, Ikeja, on Friday, March 11, 2016. 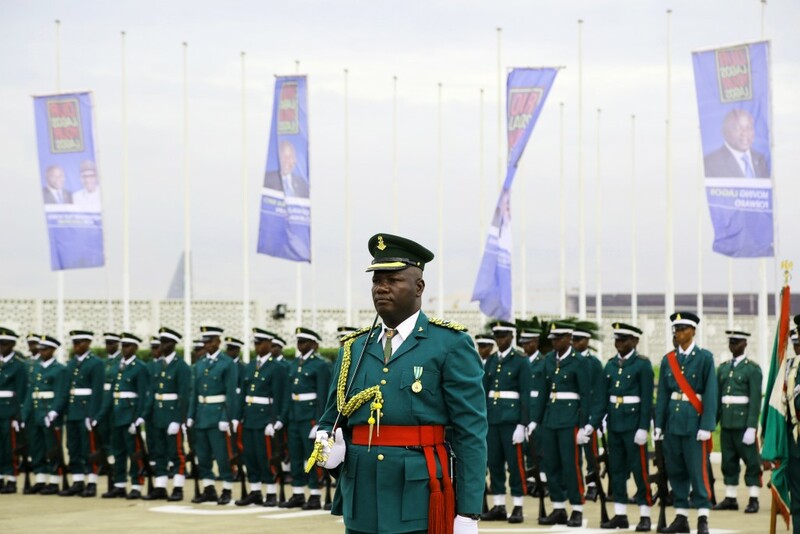 “We do not have any choice, because the engine room of whatever it is that is our policy or programme is actually in the public service and in the civil service, so it is important that we must tag along on the same wavelength with all the civil servants for us to be able to achieve all the programmes our party, the APC has decided to put across to all Nigerians,” he said. 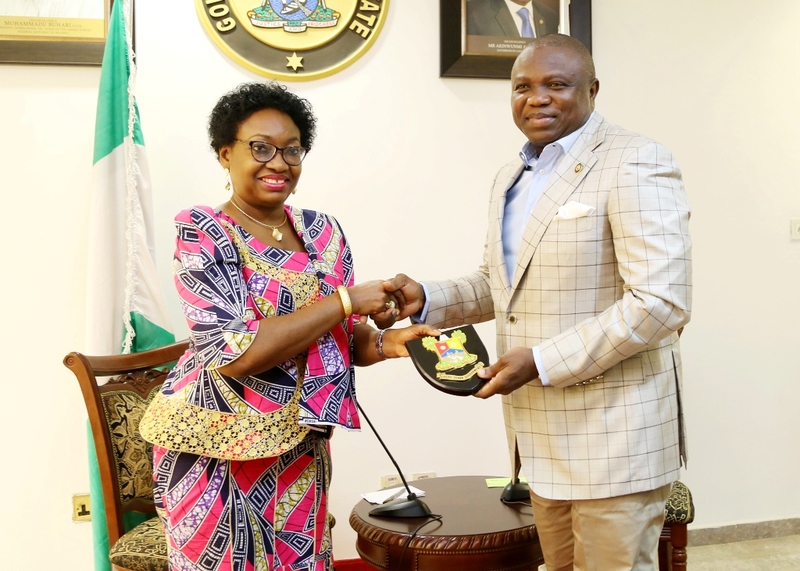 He assured Mrs. Oyo-Ita of his administration’s continuous support to enhance the partnership between the state and federal government in the areas of training and retraining of public servants, saying that it was germane to ensuring continuity in governance. 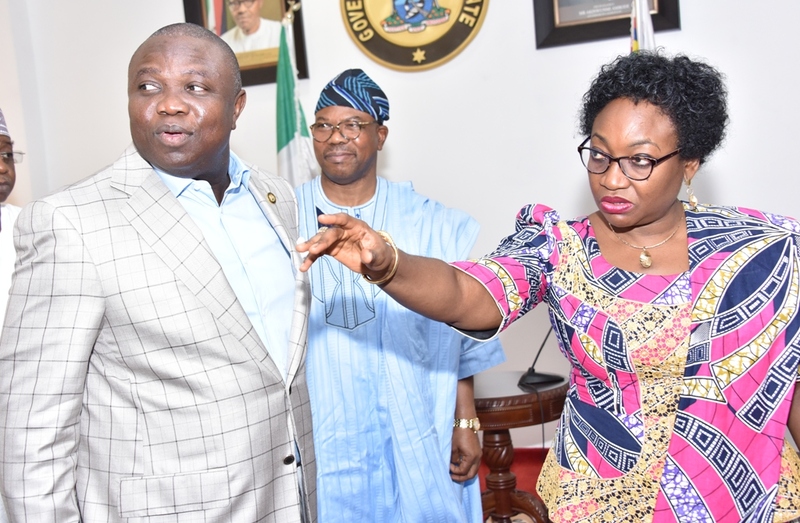 L-R: Lagos State Governor, Mr. Akinwunmi Ambode, with Permanent Secretary, Office of the Head of Service of the Federation, Chief Yemi Adelakun and Head of Service of the Federation, Mrs. Winifred Ekanem Oyo-Ita, during a courtesy visit to the Governor, at the Lagos House, Ikeja, on Friday, March 11, 2016. “So it is in our better interest that we enhance this relationship. 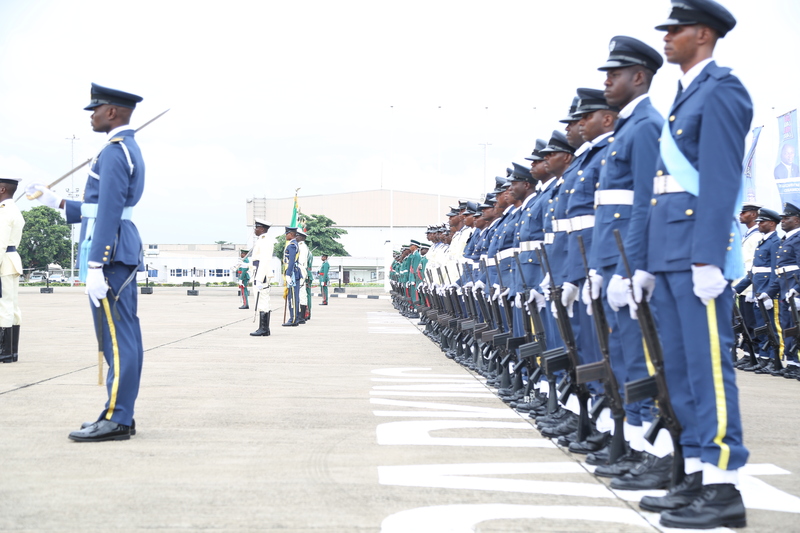 I give you my commitment further to say that there is value in it, it is important that we build a virile civil service that can stand the test of time that even when programmes do change or parties do change, the bull work of the machinery of deliverables to our people which is the civil service, remains very strong. That is what I am committed to”. 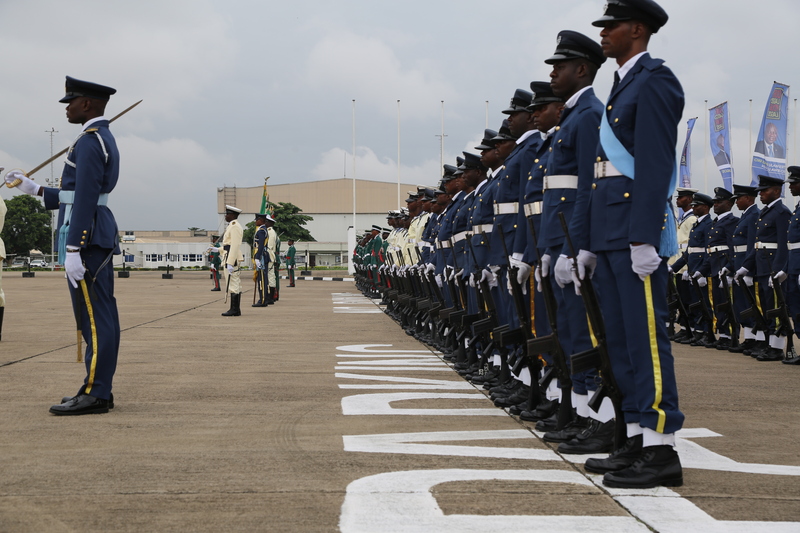 He also pledged his commitment to collaborate with the Federal Government on enhancing the commercial nature of the public service, expressing optimism that if put in the right perspective, it could engender economic growth and increase the GDP of the nation. 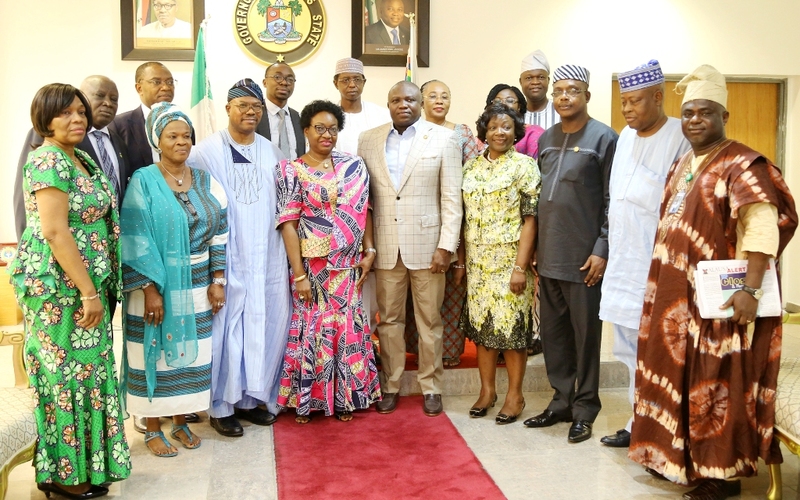 Lagos State Governor, Mr. Akinwunmi Ambode (middle), ina group photograph with Head of Service of the Federation, Mrs. Winifred Ekanem Oyo-Ita (4th left); Permanent Secretary, Office of the Head of Service of the Federation, Chief Yemi Adelakun; Lagos State Head of Service, Mrs. Olabowale Ademola (4th right); Commissioner for Establishments & Training, Dr. Benson Akintola (3rd right) and others during a courtesy visit to the Governor by Head of Service of the Federation, at the Lagos House, Ikeja, on Friday, March 11, 2016. Earlier, Mrs. Oyo-Ita said she was in Lagos to visit some of the federal institutions in the state, just as she sought the Governor’s support towards revving the comatose nature of some of the federal training institutes so as to make them efficient. 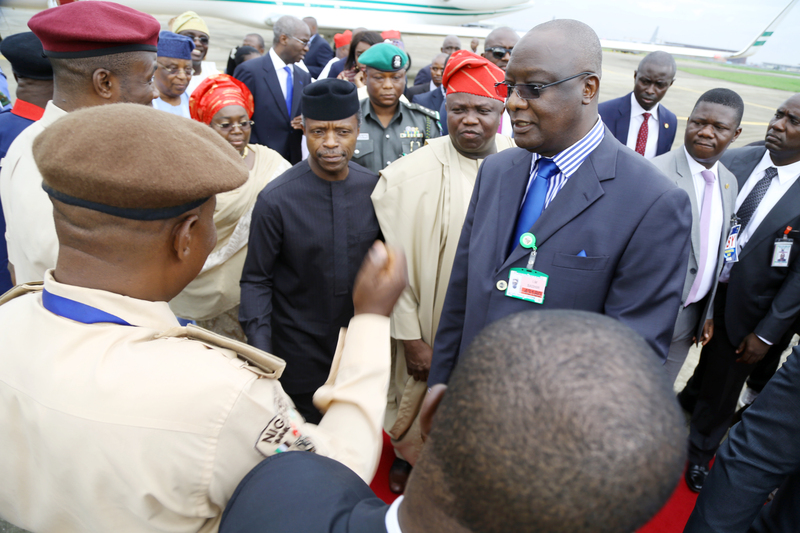 “I am very passionate about training and retraining civil servants. No doubt, you will agree with me that no matter how eloquent and excellent the policy thrust of government may be, the civil service is the engine room and if the workforce are not well trained they cannot in anyway bring to realization, the lofty goals of that administration and that is why we are looking back into what we have already developed over the years but somehow, it has been left to decay. 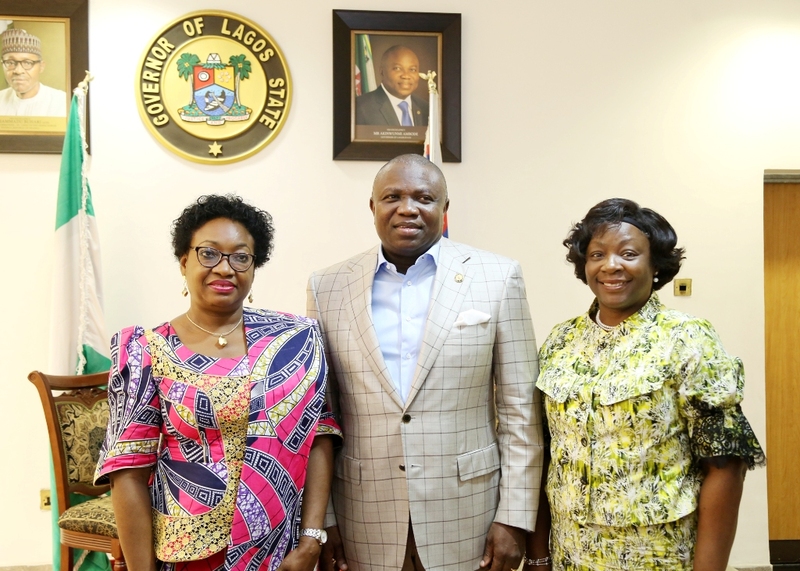 Lagos State Governor, Mr. Akinwunmi Ambode (middle), flanked by Head of Service of the Federation, Mrs. Winifred Ekanem Oyo-Ita (left) and Lagos State Head of Service, Mrs. Olabowale Ademola (right), during a courtesy visit by the Head of Service of the Federation, at the Lagos House, Ikeja, on Friday, March 11, 2016. 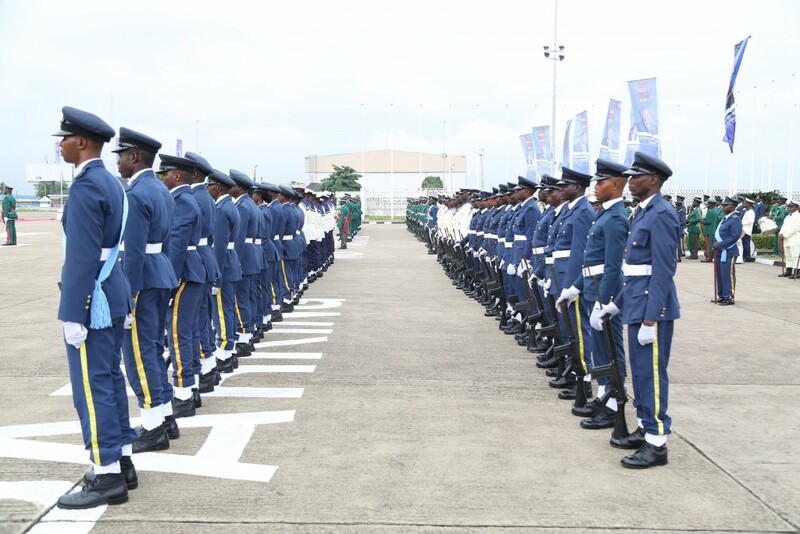 “When you see what is going on in our training institutes, for example, the Federal Training Centre in Lagos that I visited yesterday it needs a lot of work to bring it back to the level that it is expected of it. That is why I am putting a lot of effort into restructuring our training institutes, the facilities, they have the infrastructure and the resource persons, its curriculum and so on, so that we can bring it up to an international level whereby we have people coming from other African and West African countries as it happened in times past. This is one place we need your support,” she said. Oyo-Ita also highlighted the intentions of her office to improve on the commercial orientation of Ministries, Departments and Agencies (MDAs) of the Federal Government, saying the economic downturn has made it imperative for MDAs to become more commercial oriented. 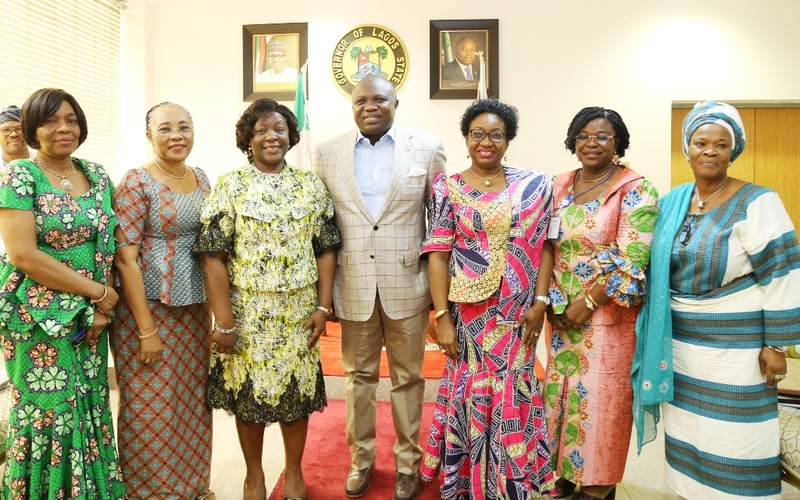 R- L: Lagos State Governor, Mr. Akinwunmi Ambode (middle), with Chairman, Civil Service Commission, Mrs. Adeyinka Taiwo Oyemade; Director General, Public Service Staff Development Centre, Mrs. Olubunmi Fabanwo; Head of Service of the Federation, Mrs. Winifred Ekanem Oyo-Ita; Lagos State Head of Service, Mrs. Olabowale Ademola; Permanent Secretary, Ministry of Establishments & Training, Mrs. Folasade Ogunnaike and Director, Lagos Liaison Office, Mrs. Ibironlke Okikiola during a courtesy visit by the Head of Service of the Federation, at the Lagos House, Ikeja, on Friday, March 11, 2016. 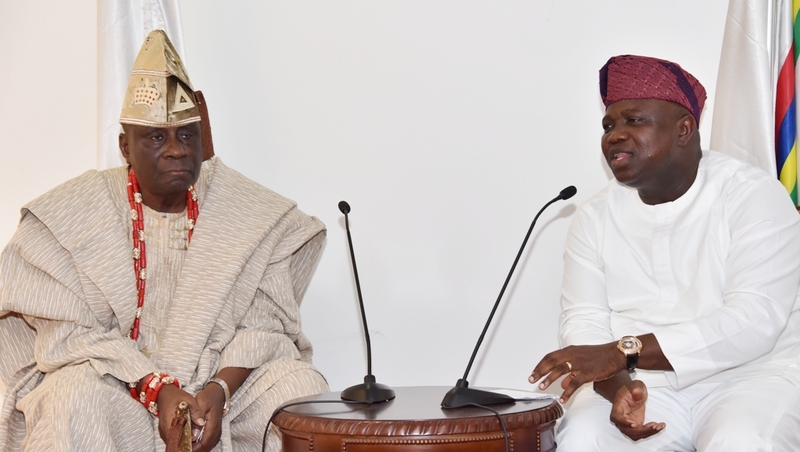 She lauded Governor Ambode’s strides in the last nine months, saying that the impact of his policies and programmes are already being felt across the state. “Indeed it is an honour to be given this opportunity to visit and pay a courtesy call on my own brother and classmate. When we left UNILAG in 1984, we never thought that when we meet, we would be meeting in this capacity because we were wearing jeans and tee-shirt and snickers and just going our happy way. We thank God for what he has used us to do in our various environments. 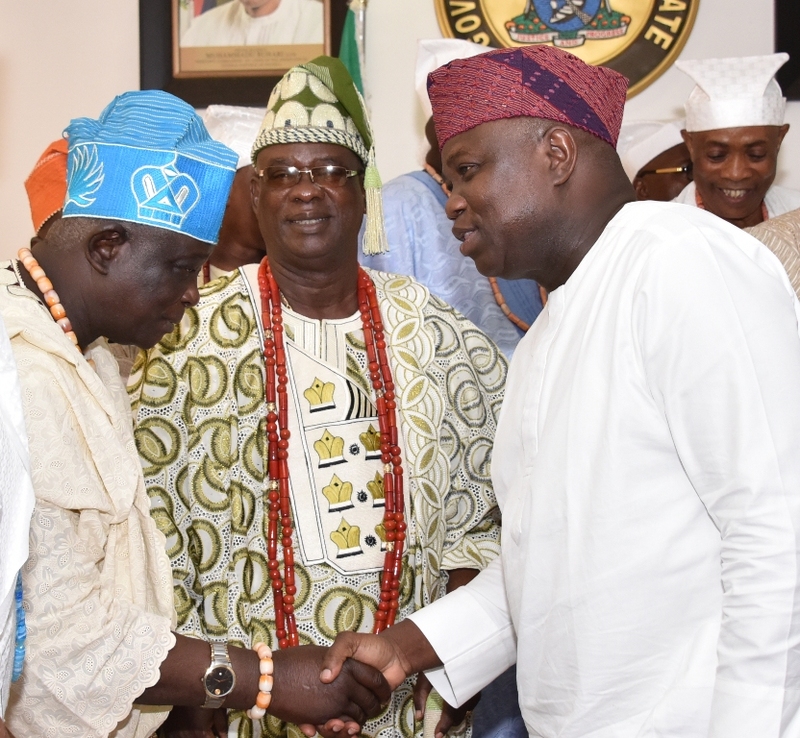 “That is why I am here to congratulate you on your well deserved election and appointment as Executive Governor of Lagos State, we are already seeing what you are doing in this state, you are continuing with the zeal and passion of your predecessors,” she said. 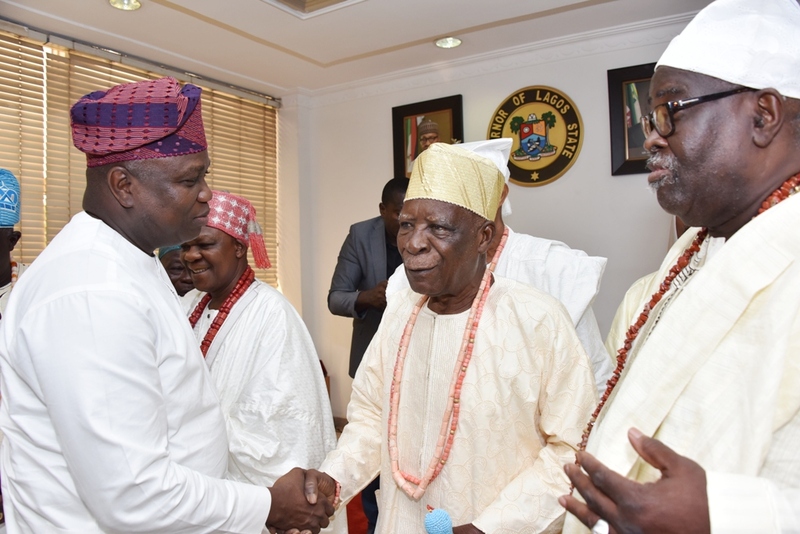 Lagos State Governor, Mr. Akinwunmi Ambode (2nd right), discussing with White Cap Chiefs – Egbe of Lagos, Chief Abayomi Olusi; Obanikoro of Lagos, Chief Ajayi Bembe and Ologun Agun of Lagos, Chief Raufu Salam during a courtesy visit by the Council of Obas and Chiefs in the State , at the Lagos House, Ikeja on Thursday, March 10, 2016. 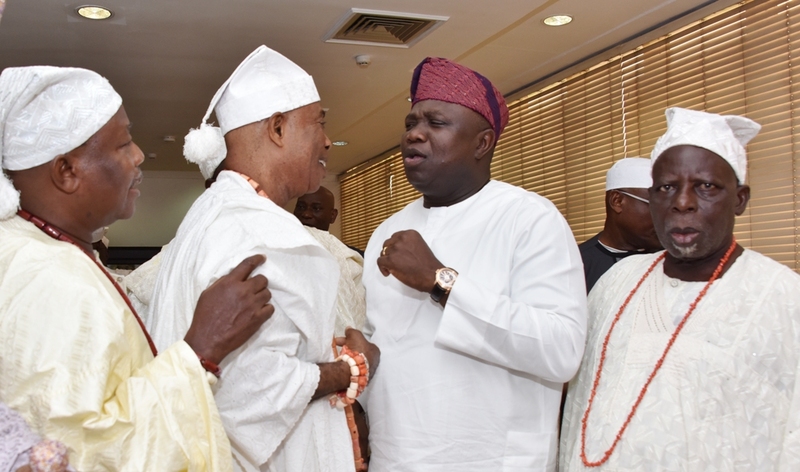 “You will recall also that the paramount reason why we are in government is for the safety and welfare of all Lagosians and we would not renege in ensuring that we keep Lagos safe and ensure that the lives and property of all Lagosians are of paramount importance to us,” the Governor said. 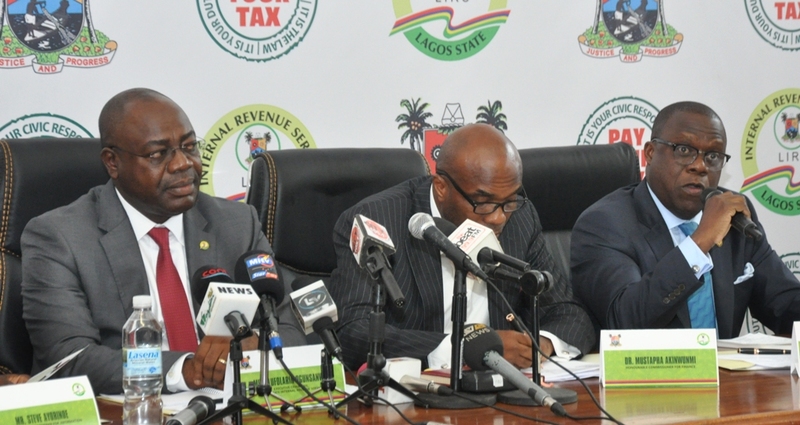 Chairman, Lagos Internal Revenue Service (LIRS), Mr. Olufolarin Ogunsanwo (middle), addressing journalists on Tax Reforms in the State, Commissioner for Finance, Dr. Mustapha Akinkunmi (right) and Commissioner for Information & Strategy, Mr. Steve Ayorinde (left) during a Press Conference by LIRS at the Bagauda Kaltho Press Centre, the Secretariat, Alausa, Ikeja, on Tuesday, March 08, 2016. 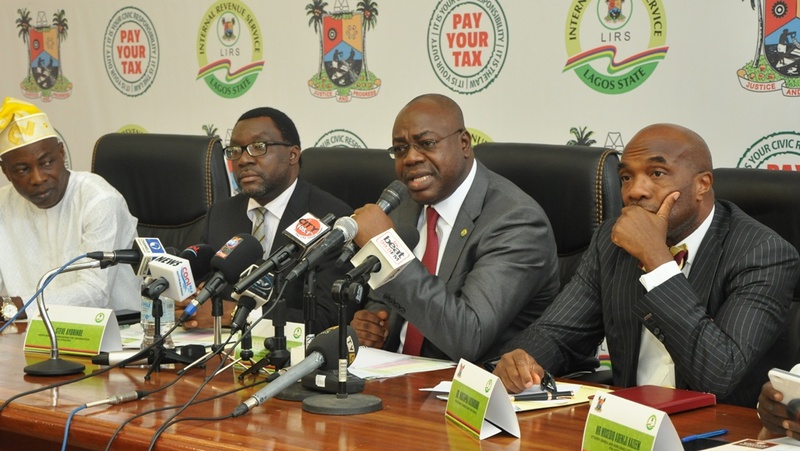 Attorney General & Commissioner for Justice, Mr. Adeniji Kazeem; Commissioner for Finance, Dr. Mustapha Akinkunmi and Chairman, Lagos Internal Revenue Service (LIRS), Mr. Olufolarin Ogunsanwo during a Press Conference on Tax Reforms in the State by LIRS at the Bagauda Kaltho Press Centre, the Secretariat, Alausa, Ikeja, on Tuesday, March 08, 2016. Commissioner for Finance, Dr. Mustapha Akinkunmi; Chairman, Lagos Internal Revenue Service (LIRS), Mr. Olufolarin Ogunsanwo; Commissioner for Information & Strategy, Mr. Steve Ayorinde and Chairman, Lagos House Committee on Finance, Hon. 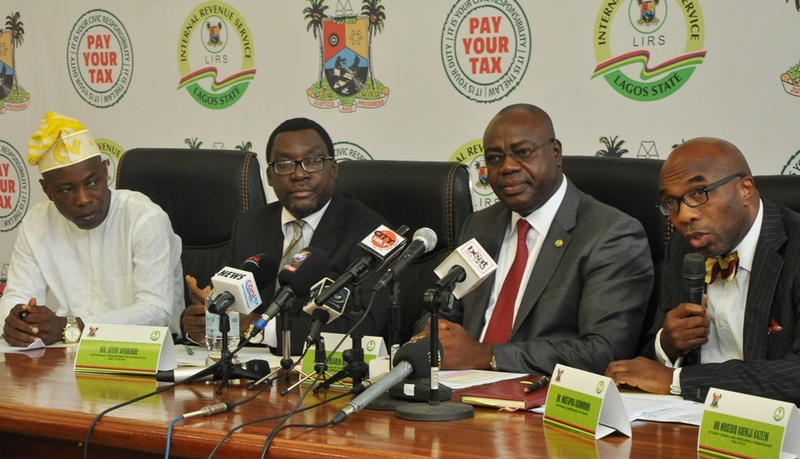 Yinka Ogundimu during a Press Conference on Tax Reforms in the State by LIRS at the Bagauda Kaltho Press Centre, the Secretariat, Alausa, Ikeja, on Tuesday, March 08, 2016.